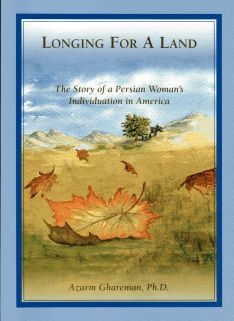 In Longing for a Land: The Story of a Persian Woman’s Individuation in America, Dr. Ghareman speaks from the authority of experiencing both pain and healing as one of millions uprooted from her homeland and culture, not necessarily by choice. In this anecdotal and poetic conversation, she invites us to share her personal psychological pilgrimage as she reconnects with her Persian heritage. With a unique perspective on cultural individuation which comes from her background as a psychologist, educator, and translator of Persian poetry, she offers her story as a gift to anyone living in diaspora. This book speaks to all those seeking a nourishing sense of home and connection. I am now forty-three years old and feel more at ease and content in my life now than ever before. As witnesses to my story, you can testify that my current state of mind has not been handed to me on a silver platter. I have walked through my pain and suffering and been relentless in examining my life and its losses. I didn’t know any other way. Trying to explain how this current state feels is like struggling to tell someone what a rose smells like. Let me try anyway. I feel less tormented, less haunted, less pressured, less tense, and less constricted. As I travel down my path, I don’t pull in and out of the “American” lane or the “Persian” lane like a driver on a freeway anymore. It seems to me that I have integrated these two parts of me in such a way that I feel more comfortable staying in “my own lane”. Download the whole chapter (PDF, ~5 pages). Order the book on our Purchasing page.